The 42nd annual Hampton Classic Horse Show concluded this Sunday September 3, 2017 at 240 Snake Hollow Road in Bridgehampton with festivities beginning at 12 PM. The show which ran from August 27 - September 3 is renowned both for being one of the largest outdoor shows and for hosting the most illustrious spectators with past attendees including Bruce Springsteen, Jennifer Lopez, Sofia Vergara and many others. Three years ago I attended this event for the first time and was awestruck by the elaborate sartorial attire and detailed table settings of this ostentatious affair. The classic has officially been running for over 75 years but it can be traced back to the 1900's when it was called the Southampton Horse Show. After being suspended during the World Wars and reinstated in the 70's, the show which includes more than 50,000 spectators and 1,600 thoroughbreds received the coveted Heritage Competition Status in 2009 - the second horse show ever to accomplish this feat. For the past three decades, top horse riders have congregated in the lush Hamptons to compete with fellow riders for the coveted Grand Prix prize. This year there was a stunning upset as Daniel Bluman, the 27-year-old rider born in Colombia, beat out both six time Hampton Classic Grand Prix winner McLain Ward, and legendary American rider Brianne Goutal. Bluman out-performed both in a three-horse-jump-off and grabbed the $300,000 prize. Upon his stunning upset Bluman took off his helmet and galloped on the field while pumping his fists in the air as the normally staid Hamptons crowd responded with rapturous applause. Bluman who was born in Medellin Colombia has long held dual citizenship with both Colombia and Israel through his mother Orly Bluman who hails from Israel. In December 2016, Bluman, who had represented Colombia in international competitions for 8 years, decided to compete under the flag of Israel. At the time he commented, "I love Israel and I love everything that it means. I have always been very close to Israel. I went to Hebrew school growing up, and my grandfather, who is a Holocaust survivor, was three years in Auschwitz." One of the contributing factors in Bluman's decision might have been his marriage to Ariel Epstein this past year, an amateur rider who also represents Israel in competition. This auspicious afternoon was the third time this week that Bluman, riding his horse Ladriano Z, has galloped off the field with a victory lap. Enough about horses, this event is also one of the premier society events of the summer with celebrities and socialites gathering in their best threads to say goodbye to the Hamptons social season. This year was a bit under-attended as guests anticipated rain for an afternoon that turned out beautifully. Nonetheless, numerous luminaries such as Brooke Shields, Christy Turlington, Madonna, Mary Kate Olsen, Don Lemon and countless "Housewives" joined mega-moguls Howard Lorber, Ziel Feldman, Lyor Cohen and Michael Bloomberg to enjoy the afternoon's festivities. Also in attendance was Southampton's counterterrorism unit which dispensed its elite security detail to protect the illustrious crowd. Lest you think the location of the tables at this event is the haphazard choice of some absent-minded party planner, I will let you know the seating is conducted with meticulous detail paid to social status and monetary disbursement. Even the VIP tent you are placed in is a pivotal decision - if you are confined to the less desirable tent you might not be pulling your weight in society. The front tables host most of the billionaires and contain the best food and table designs. 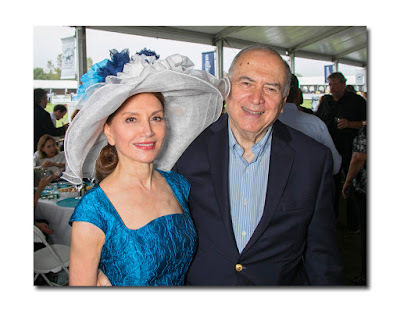 While the Hampton's classic provides linens and centerpieces for each table many patrons bring their own decor which must abide by Hampton's guidelines which prohibit additional chairs, dense centerpieces and promotional materials. In the super selective Hamptons no detail is too small for attention. I saw one mega-mogul, whose name I will not mention, threaten to fire one of the waiters for providing less than adequate service - when you shell out big bucks you deserve top rate results. If you are curious as to the cost of a VIP table tables are only available as part of an overall sponsorship package-entering the Hampton's hierarchy is no easy task. Thankfully, I had the opportunity to speak with some of the luminaries including supermodel Christy Turlington. Turlington who showed up in an understated black sweatshirt and khaki pant combination said she felt underdressed and commented that she knows nothing about today's crop of supermodels since she is involved full time with her charity "Every Mother Counts", which provides maternal health care all over the world. Turlington, is also busy training for her seventh marathon. Another low key attendee was Donna Karan who showed up in some of her own Urban Zen designs to watch the competition. She jokingly commented that she always wears the same kind of clothing preferring comfort above everything. As the afternoon began to wind down, I spotted comedian and cable news reporter Bill McCuddy, who has been coming to this event for ten years, to watch his daughter ride and see where his money goes. McCuddy was sitting near Michael Bloomberg who also came to watch daughter Georgina Bloomberg participate in the competition as photographers excitedly snapped away. The afternoon which usually lasts until 4:00 PM concluded at the early hour of 2:45 PM with guests lingering to cherish the last moments of the busy social season.